Before I left for my week of vacation in Kauai I looked at the weather forecast and it said Partially Cloudy or Rain pretty much every day while we were there. Although I was bummed that it might ruin my plans for lying on the beach, I got excited because that meant I might be in luck for catching a killer sunset. Of course once we arrived at Kauai the weather changed completely and it was mostly beautiful days with hardly a cloud in the sky at sunset. 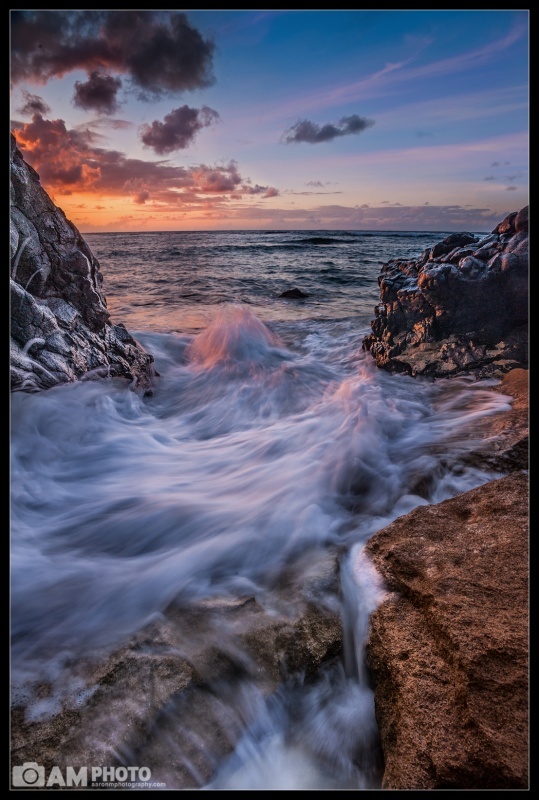 I originally setup in this location because the waves were creating some beautiful water motion in this little channel and the clouds had been positioned perfectly for the sunset. Unfortunately, when the sun got low enough to begin the light show, the clouds picked up and started high-tailing it out of my composition (moving to the left). From this spot I was able to setup my tripod on a couple rocks and avoided getting sand in my tripod (sand is about the worst thing for a nice tripod), and the rocks were high enough to keep me mostly dry when the waves came in here I waited until the wave started retreating from the little channel to open the shutter. To my delight, the exiting wave hit some rocks in the middle of the channel and splashed up, catching some of the beautiful setting sunlight.